Midwest where friends, family & fun come together!!! Custom Furniture locally made in Tipp City Ohio. 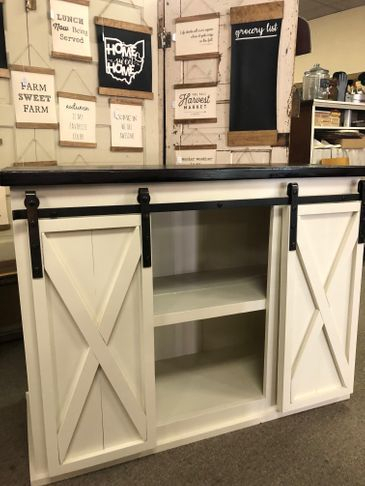 All of our furniture is made from solid wood (no veneer) and features a unique rustic industrial farmhouse style in antique white & black. We offer sliding door consoles in a variety of sizes and stains plus other custom designed items. An island extension & wine console option are also available. Prices range from a simple 4 foot console for $495 to an extended 6 foot console for $845. More info below. Also offered are a variety of pre-made signs to enhance any home decor. Please note that each piece is a hand made custom build, no two are exactly identical. Your piece is always made special just for you.